What about those who still like to decide last minute where to eat? Some of the restaurants using the ticketing system put a few tables aside for walk-ins, but there are no guarantees. Right now, restaurants such as Thomas Keller’s French Laundry in Napa and Per Se in New York City, Alinea, Next, and the Aviary in Chicago are using a ticketing system, but others will eventually follow when they see the dollar savings that are passed on to the restaurant because of the new system. 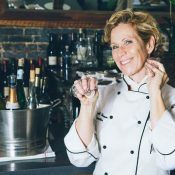 Liz Thompson is a restaurant consultant who specializes in recipe development and menu writing and has co-owned two Los Angeles restaurants.